Some people may want clothes that are not difficult to manage if a health condition, like a stroke has affected them, and find some articles of clothing hard to put on. Garments that have been altered and use considerably more straightforward fastenings can make dressing much easier. For those who are wheelchair users, pants available to purchase on the high street might not be suitable. This is because these pants will have been made to fit somebody who's standing but when you sit the rear of the pants get at the back. This is pants that have been made especially for a wheelchair user will be much higher at the back. The fabrics will be the same as clothes that are regular but the way the pants are designed and sewn will be distinct. The seams avoid causing any irritation to the skin and thus will probably be a lot smoother. A cape or a fleece wheelchair poncho is both great for people who find it almost impossible to deal with tops or coats with sleeves. In addition, they are not cool enough to be worn as a warm top to wear under a lined waterproof for winter months or when it's somewhat chilly outside. 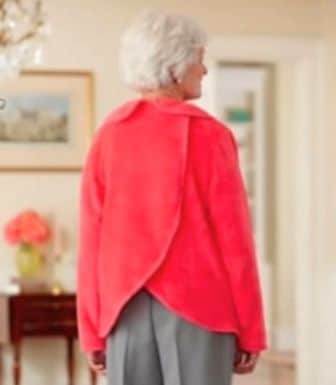 Many elderly folks enjoy having pants using a waist band which has elastic all the way so that they do not have to be troubled by zips, buttons or other fastenings. These pants are accessible for wheelchair users and for both individuals who are able to stand and walk. There are a number of firms that offer garments that has been adjusted to suit individuals who are disabled or make use of a wheelchair. These firms possess the experience with finding the right solution to their clothes needs of helping many people and carers. If you're uncertain of which products would be ideal for your needs phone them for a chat. There are some well thought out accessories to solve some issues that are vexing. For wheelchair users who self-propel the sleeves of their coat might not become clean. To stop this happening they could attempt some see-through cuffs which cover the forearm element of their coat, thereby keeping the sleeves clean. These cuffs are great to wear with a warm lined cape as they are able to act as sleeves and are also accessible a warm lined variation for colder weather. One of the most famous winter products for both kids and grownups is the wheelchair snug. As the snug has a warm fleece liner together with a waterproof outer shell and keeps the legs and feet warm and dry. The liner is detachable so it's simple to launder and it can be put on immediately minus the user needing to make an effort to stand or transfer to put it on. Wheelchair jeans are merchandise that is extremely popular as they may be perfect to be worn for many functions. As jeans offer a cursory appearance as well as a smart they could be dressed up or down depending on the top and shoes you wear to complement them. The best part of all is that usual jeans will not fit a wheelchair user a lot better than a well cut pair of wheelchair jeans and thus be more comfy. Try to get proper measurements of your body before placing your order online. It will help avoid any disappointment of getting something that doesn’t fit the right way.